A compilation of news, context and little-known facts related to Oklahoma. Oklahoma has one of the highest rates of child homelessness in the nation, and the number of homeless children has grown, according to a report released this week. Oklahoma ranks fifth worst among states in the percentage of children under 18 who are homeless, according to the American Institutes for Research, a nonpartisan research group based in Washington, D.C.
Oklahoma had 43,643 homeless children in 2012-2013, up from about 33,384 in 2010-2011, according to the report. 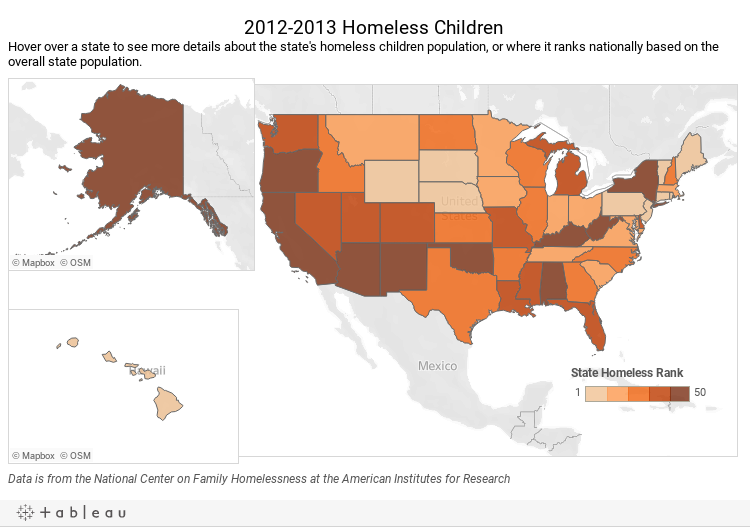 Kentucky, New York, California and Alabama each had higher rates of child homelessness. The study defines homelessness as being without a permanent home, including those on the streets, in a shelter or temporarily living with friends or family or in a hotel. About three-fourths of homeless children are in temporary or transient living situations, as opposed to being on the streets or in a shelter, the report said. Kathy Brown, the homeless education coordinator for Oklahoma City Public Schools, said the numbers are not surprising. The Oklahoma City district has identifiedat least 2,500 school-aged children as being homeless, Brown said. The actual number is expected to be higher. Tulsa Public Schools has identified 1,238 homeless children. Many of those students bounce among the homes of friends and family. In many cases, their parents have lost their home, been evicted or incarcerated, or the children have been kicked out or have moved out. Students shifting between homes can struggle to find a stable situation. The report notes that homelessness can cause children to miss school, repeat grades and eventually drop out of school. Child homelessness can also impact social relationships, employability as an adult and health. Loida Delgado, the homeless liaison for Tulsa Public Schools, said some students are temporarily homeless due to a family crisis. Some, though, are reported as homeless every year. Tulsa and Oklahoma City district officials said they work with homeless children to try keeping them in the same school, where they are more likely to have a support network of friends. That often includes giving students bus passes they can use as they move to different locations throughout the city during the school year. State Schools Superintendent Janet Barresi said the report highlights the need for services for homeless children in Oklahoma, especially given the socio-economic challenges already facing the state. While there are groups helping homeless students, Barresi added more resources are needed. “Far too many parents in our state are less than a paycheck away from homelessness,” she said. “As a result, an ocean of children is adrift in hopelessness and helplessness, and yet we expect them to arrive at school every day prepared to learn. A private prison in Hinton that has been vacant since 2010 is set to reopen after the prison’s corporate owner signed a contract this week to house federal inmates.